In the Western Cape’s own French corner, there are almost too many options for mouthwatering meals. 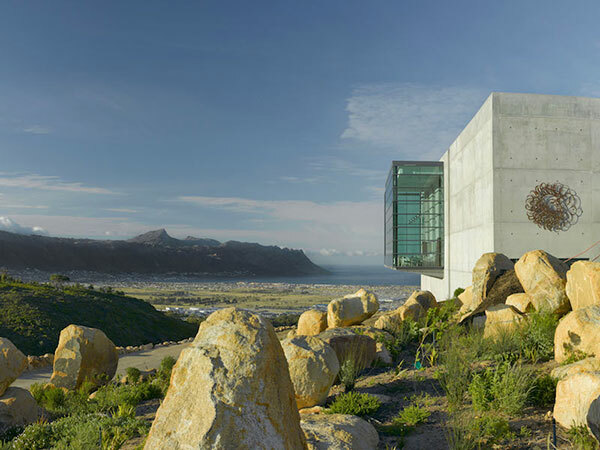 We’ve narrowed it down to the 15 spots to cross off your Franschhoek bucket list first. This selection comprises all the Franschhoek restaurants that made the cut for the 2018 Eat Out 500, the list of best restaurants in the country as rated and reviewed by our panel of critics for the 2018 edition of Eat Out magazine (on sale now). But we know there are many more great spots in the area. Please tell us about your favourites in the comments at the end! Look forward to delicious all-day breakfasts, such as spiced shakshuka with labneh and flatbread; mushrooms on toast with spinach purée; and poached eggs with miso Hollandaise. For lunch, feast on a burger, a waffle with buttermilk-fried chicken, or open sandwiches. Stock up on coffee or pastries to take home. Headed by charcuterie master Neil Jewell, here you should get the charcuterie platter for starters, which is filled with Spanish salami, hazelnut salami, country ham, cured sausages, pork rillettes and flatbread. For mains, choose pan-seared linefish tagine, or Karoo lamb with potatoes and waterblommetjies. 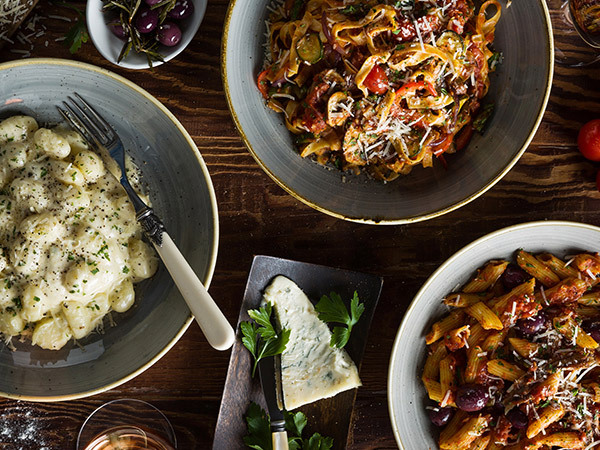 Vegetarians will love the butter bean agnolotti pasta with artichoke for starters, and pearl barley risotto with celeriac and mushrooms as a main. Book a table under the trees for a fabulous view of the vineyards. This cosy spot offers French dishes imbued with local flavours. The pork belly with crisp crackling and rich jus is a must, or try the crispy Mauritian sea bass on a bed of peas and rice with a light herb dressing. Vegetarians are offered two risottos – wild mushroom or minted pea, and a roast pumpkin pasta dish with toasted pine nuts. Have their local cheese selection with something from their extensive wine list. Famed Franschhoek forager Chris Erasmus brings his imagination and lust for local ingredients to Foliage. An ever-changing array of seasonal ingredients appears in surprising combinations, such as yellowfin tuna tartare with herb stems, wood sorrel, persimmon atchar and horseradish ‘egg’; barbecue whey-braised Spier beef brisket with wild watercress pomme purée, porcini and wild herb potato nest; and s’more-inspired caramelia delice with peanut butter and marshmallow chocolate rock. A dish at Foliage. Photo supplied. 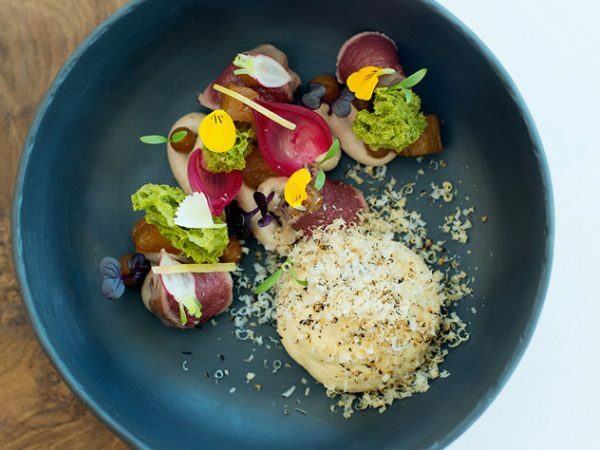 Chefs Nic van Wyk and Westley Muller have worked closely with cellarmaster Takuan Von Arnim to create new dishes to complement the estate wines. Start with braised octopus pasta with smoky paprika and chorizo. For mains, go for melt-in-the-mouth short rib, duck pie with cherry jus, or steamed kingklip with coconut cream and turmeric. Finish with a rhubarb-and-guava crumble. Small plates at Haute Cabrière. Photo supplied. La Petite Colombe is the winner of the Eat Out Retail Capital New Restaurant of the Year, where Scot Kirton and James Gaag worked with head chef John Norris-Rogers to create a menu of beautifully executed food. Think salmon with brinjal, miso mayo, kalamansi, avo and umami jelly; barbecue quail lollipops with langoustine, mussel velouté, bok choy and playful popcorn; and springbok tataki with macadamia dust, Jerusalem artichoke espuma and pistachio. Seared Wagyu rump with fall-apart braised brisket is taken to new heights with deep-fried sweetbreads, soubise and sherry velouté. For dessert, nectarines with almonds and geranium are a standout. One of the stunning La Petite Colombe dishes. Photo supplied. 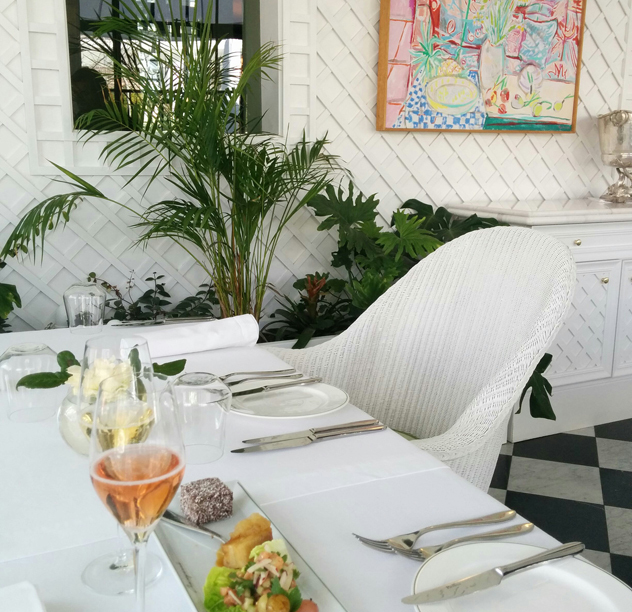 Chef Darren Badenhorst’s new space offers fine-honed classic French cooking paired with Franschhoek wines. Think poached duck egg with confit pork belly; king oyster mushrooms with comté velouté and forest greens; or baked hake perfectly complemented by herbacious dill viennoise. Playfulness and nostalgia are introduced in desserts such as the tribute to honey, featuring bee pollen, honeycomb, meringue, rose caviar and flowers. A dish at Le Coin Français. Photo supplied. Vanie Padayachee’s menu covers a range of fantastic Indian cuisine from chaat and tandoori to curries, dhal and briyanis. Start with golgappa-and-tamarind pani for a flavour explosion. The machli amritsari (deep-fried fish goujons) are soft, chewy and fluffy. Another highlight is naan loaded with chilli, coriander, garlic and paneer. For dessert, try gajar halwa tart, kulfi, phirni or tandoor-baked pineapple-and-saffron crumble with coconut and fennel seeds. Wines include a variety of local options by the bottle and glass. 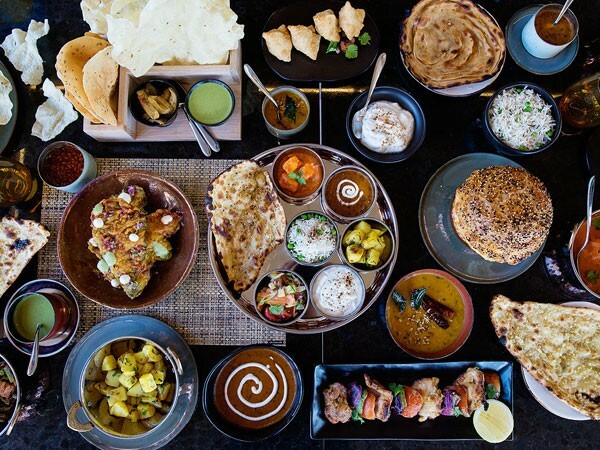 A colourful Indian feast at Marigold. Photo supplied. 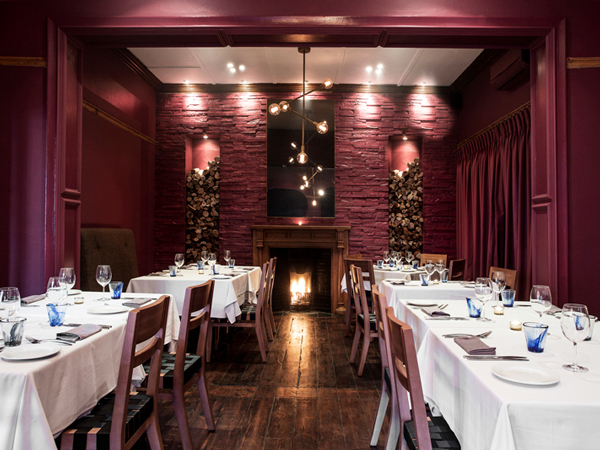 Expect no-frills French cooking at this light and bright spot. For starters, the gruyère soufflé is suitably rich, while the duck liver parfait with apple chutney is crisp and tart, served with warm, toasted brioche. 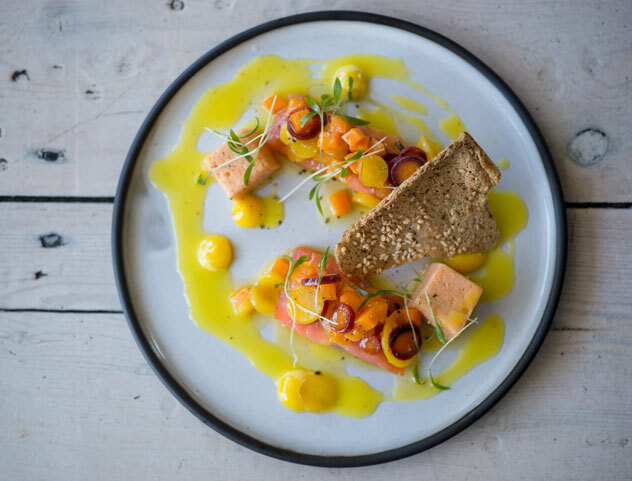 The sugar-cured Franschhoek salmon trout with ponzu dressing wakes up the taste buds. 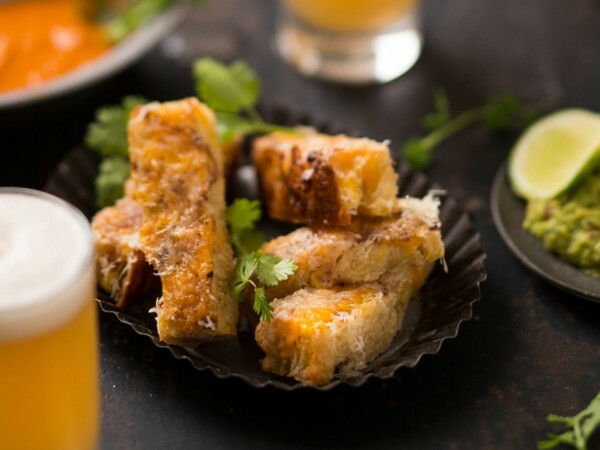 Also try crispy-skinned chicken breast stuffed with tarragon chicken mousse, the ginger-glazed pork belly, or Peking duck breast with a plum sauce. If you can resist the raspberry soufflé with French vanilla ice cream, you are strong indeed. Inside Le Lude’s Orangerie restaurant. 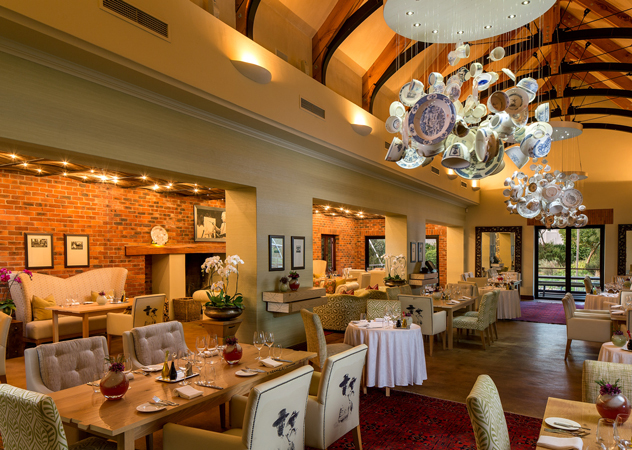 Chef Michelle Theron’s menu offers a modern interpretation of traditional flavours and techniques. The superb slow-roasted Karoo lamb is plated with porcini tart fine, burnt butter and brandied apple purée, while the signature Cape bokkom salad uses tomatoes, apricots and quail eggs to soften this pungent West Coast delicacy. Also go for the family lunch, served on Sundays with generous roasts and veg. Inside at Pierneef à La Motte. Photo supplied. Sit inside for an elegant ambience or outside for something more relaxed. Either way, there’s no bad choice. That’s especially true when it comes to food. A starter of cured and smoked trout with harissa, yuzu pearls, dill-cucumber texture and candied lemon korokke vies for attention with confit wild rabbit terrine, caramelised onion soubise and smoked pork belly in a red-and-black kidney bean cassoulet with wild porcini broth. Mains such as Karoo lamb neck with roast garlic and parsnip purée and minted halloumi will please carnivores; while vegetarians will love the raclette and leek arancini. The standout dessert is condensed milk sago pudding with pistachio crème and coconut. 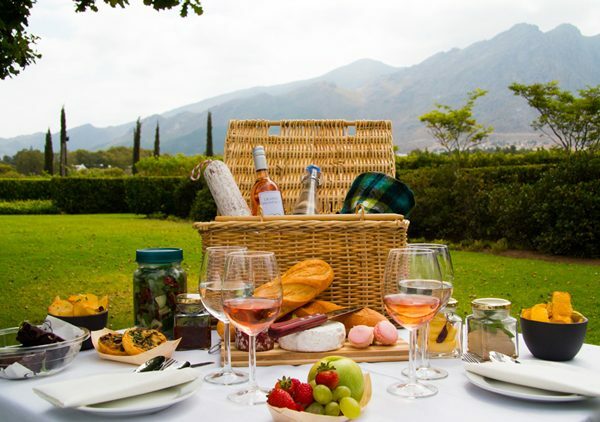 Enjoy the luxurious picnic at Grande Provence. Photo supplied. A new location brings a new menu for chef Reuben Riffel. 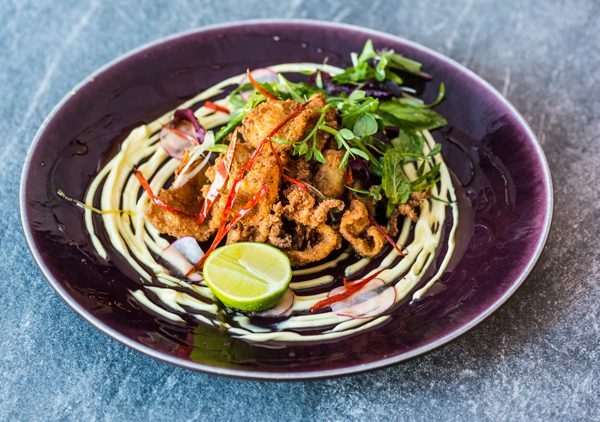 Loyal diners will be happy to see the signature pork belly with fynbos honey, and signature chilli-salted squid with greens. Another classic is the tuna tataki with lime mayo and toasted sesame seeds. 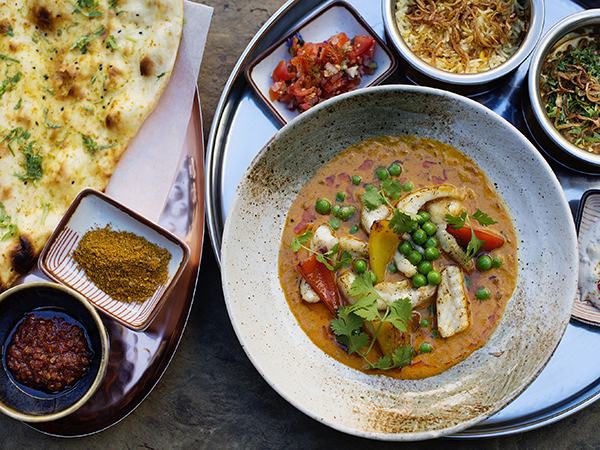 The new menu offers plates for sharing, while main courses range from peppered picanha steak to butter chicken curry and Vietnamese pho. For dessert, go for oozy baked camembert and bacon jam or crème brûlée with roasted pears and white-chocolate soil. A dish at Reuben’s. Photo supplied. Chef Ryan Smith’s cuisine is driven by local ingredients. An array of morsels start your meal: watercress foam with mushroom dust, snoek fritters, tomato butter with sundried tomato bread and pumpkin fritters. A starter of tender pork belly with a Cape Malay sauce is a masterful combination, elevated by puffed crackling and sweet potato purée. 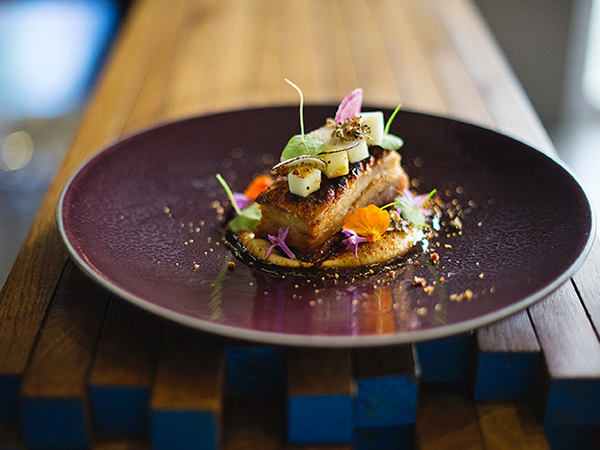 Chakalaka kingklip and roasted duck breast with honey-and-dukkah glaze and roasted kohlrabi also bring strong African flavour. The chef ’s selection is also another way to enjoy Ryan’s creativity. For dessert, a unique take on a rum baba, the Van der Hum baba with kumquat ice cream, poached kumquats and honeycomb will tempt with bright citrus flavour and tangerine liqueur. The aged Boerankaas fondue with crunchy rusks is an innovative and a tasty way to end the meal. A dish at Ryan’s Kitchen. Photo supplied. Tuk Tuk gives you the option of choosing individual plates or a sharing concept of three- or five-plate options for communal dining. With a good combination of textures and Mexican-inspired flavours, each dish is perfect for enjoying with the beers made on site. A favourite is fresh corn nachos with guacamole, pico de gallo and sour cream, served with your choice of cheese or pulled beef. The seared tuna taco with guacamole and smoked onion aïoli, and the spicy sweetcorn nuggets with chipotle chilli dip are also good choices. The Tex Mex burger is succulent and oozes flavour with a good sting of heat. Sweetcorn nuggets with chipotle dip at Tuk Tuk Microbrewery. Photo supplied. 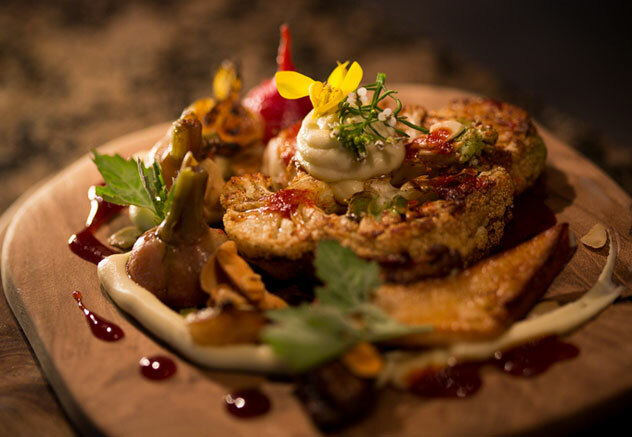 Chef Christiaan Campbell’s food is based on a philosophy of sustainability. 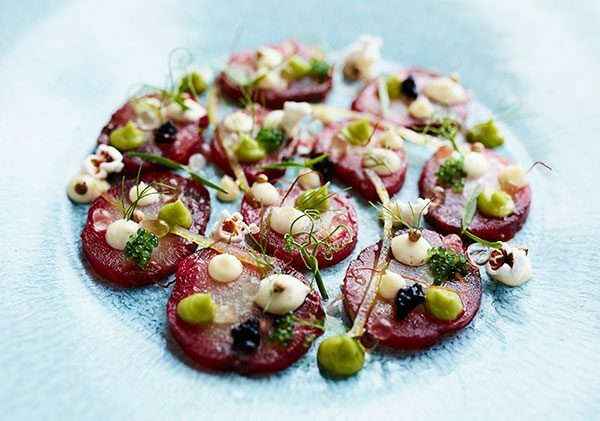 Starters include lamb broth and pulled lamb belly, dry-aged Angus beef tartare and butter-poached chicken with a soft-poached egg, forest porcini and olive oil. For mains, try 16-hour, hot-smoked Angus beef brisket with ’weed’ salad and polenta, or slow-cooked lamb shoulder with broccoli risotto and goat’s cheese. 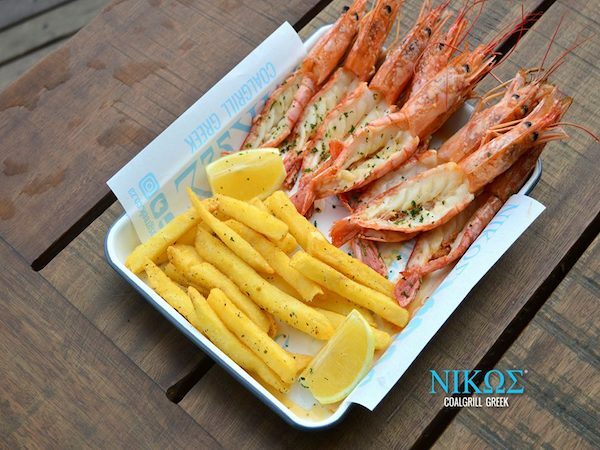 There are also seafood options such as casserole of hake, Jerusalem artichokes, pickled mussels and white beans. A shared platter of three meat dishes is popular. 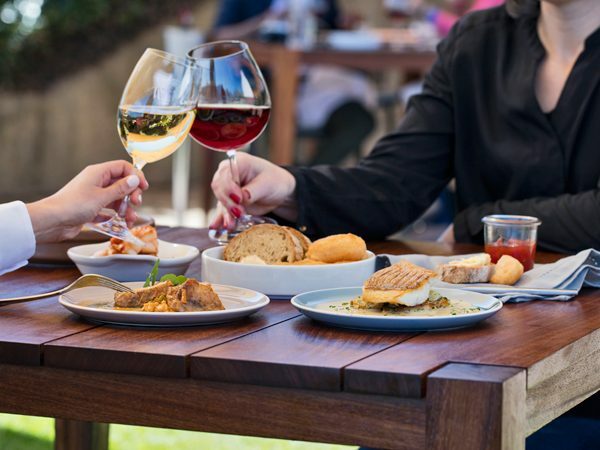 Enjoy everything with a selection of Boschendal wines. This selection comprises all the Franschhoek restaurants that made the cut for the 2018 Eat Out 500, the list of best restaurants in the country as rated and reviewed by our panel of critics for the 2018 edition of Eat Out magazine (on sale now). But we know there are many more great spots in the area. Please tell us about your favourites in the comments below. You have left out the restaurant which the others aspire to be like. Pierre Hendriks owns Bon Vivant in Dirkie Uys Street and is one of the pioneer chefs in Franschhoek. Dining there is a real treat.